Virgin Group that is known for a variety of brands in absolutely different spheres has announced it signed Saatchi&Saatchi to launch its new water brand. The new brand that was announced in the beginning of 2012 is a result of Virgin’s cooperation with the Israeli food and water company Strauss Group. The giants formed a venture that sell and service eco-friendly water products, including home water dispensers and office water coolers. The brand will first launch in the UK this year and later expand across Europe. The Virgin Group’s investment company invested $7.5m in the first stage at the end of 2011, and Strauss Water invested $2.5m. Strauss Group owns 58 per cent of the venture, and 42 per cent belongs to Virgin. Virgin Green Fund is a special branch of Vitgin Group that invests in the renewable energy and resource efficiency sectors. “The partnership will leverage the complementary capabilities of both companies: Strauss Water’s unique technology and expertise in solutions for drinking water treatment, and Virgin Group’s powerful brand and marketing skills”, wrote Virgin’s Bob Fear in a post on the company’s web site. 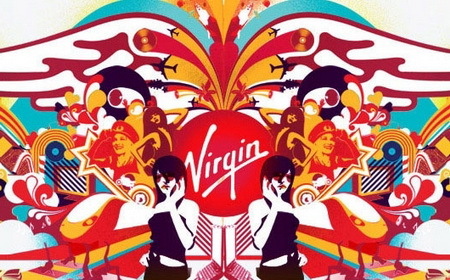 Virgin has been looking for an agency to promote the new brand since January 2012. It met the best ad agencies to explain the vision of the new brand and finally, Saatchi&Saatcchi was selected to lead the brand on the market. In early 1990’s Virgin introduced Virgin Cola to the UK market. It was marketed as ‘The Pammy’, as the bottle’s curves were designed to resemble Pamela Anderson who was very popular in the UK at the time. In March, Virgin Atlantic launched a ‘Pretty Amazing’ lip glossthat has become a part of it’s crew image and is available for the airlines passangers.